A new pasulobong products is emerging in Cagayan de Oro City, this is Chino’s Deli. A local meat processing business that was recently launched by Mr. Jonathan Mempin together with his lovely wife Mary Ann whom they just married this year. 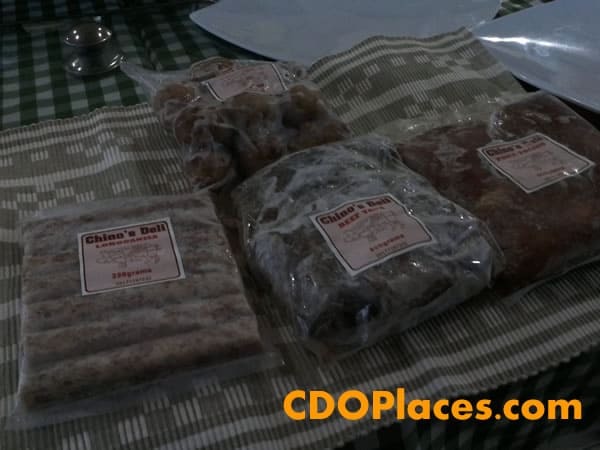 There meat deli products are made from there old traditional family recipe and further improved by his brother who is a chef in Boracay now and from which the name came from whose elder brothers name is Chino. Chino’s Deli is quite different with other known local processed meat, they specialize in home-made meat deli products from quality choice meat cuts of reputable meat suppliers. Apart from a quality meat there meat deli products contains no artificial flavorings, colorings or any extenders, only the finist spices and herbs are used. Must try is there smoked chorizo, you will definitely love it. Here are there available products with their corresponding prices. They also have other packs like 1 kilo and more for institutions. Try it! This will definitely another Cagayan de Oro pasalubong. Hi, Mike! I missed this event. I will surely drop or look for their products around CDO. I wanted to try their smoked chorizo? Is it better compared to a known pasalubong from the city? hmmm.. never heard about this yet. thanks to you I’ll probably love to try this. I’m a food enthusiast. looks yummy!